About a month ago it was revealed that Auckland Transport had come up with three options with three very costs for Lake Rd between Takapuna and Devonport (not the be confused with the other Lake Rd just a few kilometres away). As they were about to go out to consultation on it we thought we’d hold off talking about it till that happened. And now the consultation is out to the public and follows on from an indicative business case (IBC) and prior to that other assessments including a corridor management plan we discussed here. Lake Rd has long been a hot button issue for many locals and that’s reflected in the language AT use on their page for the project. The three AT have come up with are variations on the same basic theme which is to improve the corridor for walking, cycling, buses and high occupancy vehicles. The differences in them are in the scale of the changes undertaken, ranging from some minor tweaks up to major road widening, as depicted in this graphic below. All three options do share some common projects, these include vague statements about improvements to travel planning, bus and ferries etc. but the one defined change on the list is to the current Esmonde Rd bus lanes. AT plan to downgrade those bus lanes to either T2 or T3. As I understand it, the lane will be changed to a Transit lane through to the point where the bus lane peels away from Esmonde Rd to allow buses to join the busway and so some changes will be required to merge those transit vehicles back in with general traffic (or create an additional lane through the onramp). Depending on how it’s implemented I do worry we could see cars using the lanes then holding up buses as they wait for space to merge into general traffic. At the same time, I continue to think it’s stupid that buses use those Esmonde Rd lanes, bypassing the Akoranga busway station and connections to other parts of the North Shore – something that impacts me daily on my commute. Where the bus lane separates from Esmonde Rd is shown below. The three options are below. Each increased level also comes with an increased cost and increased timeframe it could be completed within. AT also say each new level comes with increased levels of benefits. While this will be true, it is of course important to measure those increased benefits against the increase in costs. The IBC looked at a number of different options for the project but the ones below were shortlisted. I’m guessing the medium investment option is either one of, or a combination of the middle three options. 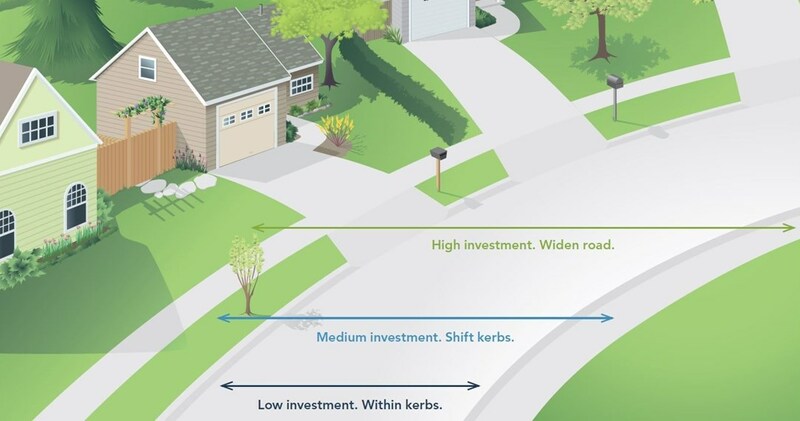 It seems from this that the high investment option should be ruled out leaving either the low or medium options, or perhaps somewhere in between. Also, hopefully the medium option doesn’t include package C which reduces the quality of existing cycle lanes. Unfortunately the rabid rabble that like to make themselves heard in Devonport / Takapuna seems to hold “reduction in the quality of service of existing cycle facilities” as a goal in itself. You should hear the whining on the Northcote Point facebook group about the cycle lanes going in there – and there isn’t even any congestion to complain about! At the moment it looks like they’re winning: they succeeded in having the cycle lanes cancelled, and they appear to have succeeded in stalling Skypath until the contractor walked away. and that’s the key thing isn’t it – you can’t blame any whining Northcote Point residents for the hard reality that Downers have walked away from NZ’s premier cycling construction project. Well, you can. Their vexatious litigation has held the project up so long that the contractor has walked away. You are being a touch naïve here sailor boy. The reasons Downers walked have nothing to do with litigation or anything else you want to pin on residents. It’s all about finance. The PPP package that AC is relying on, is quite simply a dog. So Downers signed up 2 years ago, and now have pulled out, but the delay had nothing to do with it? Who is being naïve? Skypath won’t be built in a year, 10 years or a Century unless Auckland Council tears up the current PPP funding arrangement. You can disagree as much as you like but that’s the reason Downers walked and it’s the primary reason why no other construction company will touch it. I think we can both agree that the NZTA building it as part of the UCF is the best outcome. At first glance Package C looks to be the best option. Hopefully this project wont be hijacked by the “cycle lanes solve everything” fraternity. When did anyone claim cycle lanes solve everything? You’re tilting at windmills is getting tiresome. You’re grammer is getting tiring. I’d rather see “you’re” as an obvious typo-error for “your”, than the widespread but incorrect usage of “your” by those who can’t be bothered to learn the difference. “cycle lanes are a big help fraternity”…..there; fixed that for you. As opposed to the “widening roads solves everything” fraternity that has dominated for the last 60 years? Leading to the wonderful roading environment we see today. Am I right in that all options include changing the bus lane on Esmonde Road to a transit lane? shouldn’t this be taken out as a separate project that AT can consult on and evaluated separately. Likewise the walking and cycling facilities in Bayswater Avenue could be treated as a separate project which will likely enable this to be brought forward. This would probably make it easier to compare the Lake road options with the costs and benefits of the Esmonde road and Bayswater Avenue changes taken out of the BCR calculations. One of the things that concerns me is that my gut feeling is that many of the locals will want to push for the expensive road widening as they will see that as the best solution to solving congestion. However the low BCR and the high cost will likely push it out to well into the second decade, meaning nothing will be done for years while there is endless debate about what should be done. If this happens AT can still get on with the Bayswater and Esmonde road projects. +1. Yes and my gut feel is that the medium option with improved cycling is the best. I can’t see how giving private vehicles access to that bus lane can possibly help. As pointed out in the post, cars will just need to merge back into general traffic. At peak time that traffic is slower than walking pace, because those two lanes funnel down to one lane, then effectively to zero lanes because all this traffic has to merge onto the motorway through a metered on-ramp, so all three lanes would clog up. All that would be achieved by allowing traffic onto the bus lanes would be to generate added congestion by blocking the bus lanes as well as creating a need to merge down from three to two lanes. Widening Lake Road (option C) is also going to be a waste of money, because all it actually does is extend the exact same problem from Esmonde Road back onto Lake Road. One option I guess would be to address the on-ramp situation to provide an additional lane on SH1 to the south of Esmonde Road rather than that difficult merge onto an existing fully-occupied lane. The ball is in NZTA’s court on that one, and although their road-building budget is seemingly unlimited I dare say that it would still be costly and come with undesirable environmental impacts and zero carbon upside. What is really needed is an attack on the cause, not the symptoms. We can reduce traffic by providing cheaper, more connected, more frequent, and integrated public transport that gives Lake Road users an attractive alternative to using their vehicles. That’s what is missing here in this proposal from AT. In my opinion, none of the options are likely to be successful until there are improved bus and ferry services and infrastructure within the peninsula, and that is where AT’s focus should be. I hadn’t really considered the problem of cars merging at the end of Esmonde road. All the more reason it shouldn’t be part of the Lake road improvements package. Esmonde road west bound for the most part has three lanes. two general traffic lanes and one Bus lane. How about a bus lane, a T2/T3 and a general lane? The transit lane could then start in Lake Rd and continue round the corner and all the way down Esmonde road? Cant believe people still put such faith in BCRs when these methods are so biased towards cars and their movement. Any wonder then that downgrading bus lane to T2 gains a higher BCR? I hope the high cost option gets ruled out too – taking land from adjacent landowners for road widening has not gone well at Te Atatu road. The brown house demonstrates poor urban design. To turn Esmonde Road into a transit lane is a complete disgrace. This route is counted as part of the RTN. How can it conceivably be so if buses are clogged in general traffic? However the real disaster is yet to come. The population of Takapuna is predicted to triple in about 30 years. Already two medium rise projects are being built and at least seven more are being sold off the plans. Public transport will be the only possible solution to moving this volume of extra people quickly and efficiently. And this plan intends to make it more difficult. In addition Devonport is largely a none growth area. Why should all this money be spent on a situation that is unlikely to get worse? I suspect that the answer is to get the commuters of Bayswater, Hauraki and Devonport onto buses/trams and to get people from Milford and Takapuna through Takapuna on bus lanes on both Esmonde and Anzac. AT won’t get this right because of their car centric attitude. As an example, what organisation could conceive that building a huge children’s playground at the beach with no close safe pedestrian access was anything other than flirting with death? Actually, the problem will get worse. Firstly parts of the peninsula will be (and are) growing massively, e.g. Hauraki, Belmont, Bayswater. Also the traffic IN is as bad as the traffic out. Devonport is a desirable place to visit, especially in the weekends, and any tripled size of Takapuna will exasperate the queues. Actually I am understating the problem. It will completely grind the road to a halt. It is not just a commuter problem, I think the weekends are worse. As already mentioned, the solution is to get a Bus Lane / T3 along most of the road. People can watch the buses speed by while they are stuck in the queues. At the moment, what possible incentive is there to leave the car at home and take a bus, if the buses are stuck in traffic with everyone else? “Devonport is a desirable place to visit” – well, exactly. So, make it even nicer, and go by ferry. You’d be mad to want to drive there. And if you live in Takapuna and want to visit Devonport, take a bus. The absolute worst thing would be to ‘fix the thing’ by compulsory purchasing the front 10 metres of all properties on Lake Road and widening the road for more lanes as some people are desiring. This would destroy the whole ambience of the peninsula as a desirable place. Such greedy me first people in their tin boxes need to adapt to a much more reasonable solution…………..a public transport solution. I think cycle lanes actually will solve everything. They just need to be everywhere. As someone who lives on the Peninsula but uses cycling and public transport for 90+% of journeys, I find the whole attitude of the local community amusing. They are completely blind to the reality of why there is such bad congestion. The traffic survey found that almost half the journeys made were within the Peninsula, so people are driving very short distances. In addition, the vast majority of SOVs on Esmonde Road were headed to the City, despite there being 3 ferry services. Even with the people using the ferries, most are driving very short distances to the ferry and then demanding a huge amount of public space so they can park their car all day (for free of course). King Edward Parade is choked with cars all day. When a survey was done some years ago, the vast majority had travelled less than 2kms. More paid parking and limited time zones would help a lot. Residents are choosing congestion because they refuse to even try the alternatives. Improved cycling infrastructure is not always a panacea to all our traffic woes, but in this area only a small increase in journeys by bicycle could make a massive difference. +1, AT need to be far more proactive on this, every time average midday bike parking occupancy gets to 80% another car park is upgraded to bike parking. Additionally the cycling infrastructure from the end of Lake Road through to Devonport itself, and from Lake Road to Bayswater absolutely must be improved. Here’s a thought experiment, Make Lake Rd south of Esmonde Rd bus and active transport only. This would massively free up the road and give it a capacity to move 10X more people than it does now. Transit times might even be quicker. Already bikes often beat cars in the Belmont – Hauraki section. Build a car parking building in Takapuna for those who need them for the rest of their journey. Not only would this be cheaper than widening the road but it would also avoid the massive congestion that road works would bring. This would transform the road from a slow car park to a grand promenade to rival Takapuna Beach. Lake Rd appears to be an ideal candidate for a congestion charge. A $50 charge would probably achieve the above vision but would be a petty impossible political sell. Would say $10 be enough to achieve change? It would also be an ideal candidate for a lower urban speed limit with its schools and high pedestrian numbers. Not that this would slow cars down they would be lucky to average 20k/hr at present but you might need to slow the ebikes. Choose three or four places where active modes and PT only would work – probably peninsulas, of which we have a few. I’d definitely suggest Pt Chevalier. Use international best research to show the effect removing the private car from the area would have on pedestrian safety, air quality, walking rates, lifestyle options, youth connection to the city, business success. Tailor it to each specific location, and hone in on really good PT connections and frequencies. Work out the economics for a couple of typical households. Now take it to the communites, as an option they COULD choose. But funding to do it would be only open to one of the communities, so if they want it, they have to be the first community to say yes. And there was that terribly embarrassing day when they painted the road markings and the lanes on the two agencies roads did not meet.